If you work on Google AdWords accounts, you are no doubt familiar with the new changes to exact match keywords that include 'close variants'. While the consensus from marketers is that this shift is not ideal for performance marketing, I am going to focus on what you can do to maximise your campaign performance as a result of this change. In 2012, Google introduced a feature that identified and grouped close variants for some phrases and exact match keywords, and then later in 2014, expanded it to all phrase and exact match keywords. This feature automatically matches keywords that are 'almost' the same, and groups them. For example "Running Shoe" and "Running Shoes" would be considered the same keyword. In the latest change, Google has broadened the matching rules to group broader keywords that are likely to indicate the same intent. Using the example above, instead of just matching the singular & plural (running shoe & running shoes), exact match will also match variations that have the same meaning, such as "shoes for running". Any performance marketer will tell you that different keywords will have different click-through rates, conversion rates and levels of competition. As a result, a keyword like "buy running shoes" should have a different bid to "shoes for running" in order to maximise performance. With the new change, 1 bid auction will cover all of these variants, reducing your ability to optimise bids and maximise your return-on-investment on each of these keywords. So instead of having optimised bids and ads for each variant, you will need to have one bid and one set of ads that cover them all. Google have some fantastic customisation options for other forms of targeting. For example, you can specify that your location targeting can reach people physically in your target location, searching for your target location, or both. At the moment, Google doesn't have customisation options like this for keyword targeting, but hopefully, after hearing the feedback from the advertising community, they will implement something like this so we can have the choice on how we want our keywords targeted. The new changes mean that some keywords that were unique may now actually be duplicates. This means you could have multiple keywords bidding in the same auctions. Review your keywords - especially exact match - and start removing duplicates, keeping in mind that Google is matching variants based on 'intent', rather than just singular/plural, or other punctuation. When you are faced with the decision to remove a keyword, look at your stats and remove the one with the worst performance. Even though you will be getting the same traffic, your better performing keywords are likely to have better quality scores, and therefore will be more competitive in auctions. Negative keywords are now more important than ever. Your negatives are now going to be your primary way of refining keyword targeting to exclude unwanted clicks. You can use negative keyword targeting to exclude some of the broader variants that you don't want a specific campaign to trigger for, or even use ad group level negatives to ensure the correct ad groups & ads trigger for different keyword variants. If you optimise accounts to the level we do, you will find that you have split out some close variant keywords into separate ad groups. You will now need to remove or merge some of these keywords to avoid competing with your own bids. When you are doing this, make sure that you are only combining or removing ad groups that you have no way of keeping separate. Where possible, use negative keyword targeting to keep your bids and ad groups separate. 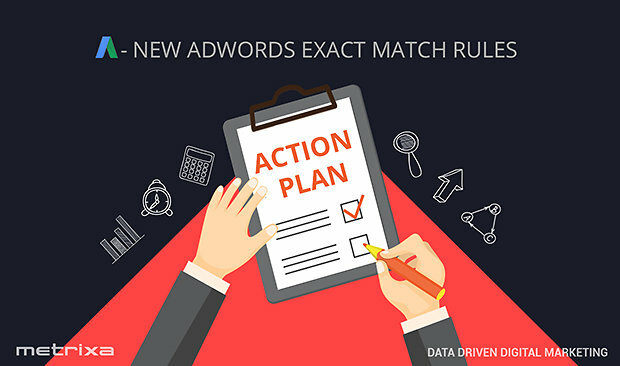 The changes to exact match keywords are here, and while you may be happy about the simplicity, or upset about the lack of control, the important thing is that you need to make sure your campaigns are structured in a way that makes sense based on the new 'close variant' matching rules. Get your campaigns and ad groups restructured, and you will minimise any negative impact the change has on your campaign performance. If you have not updated your campaigns lately, this may even be a good chance for you to make some significant improvements and increase your return-on-investment (ROI). What are you doing to address the 'close variant' exact match keyword changes? And more importantly; how is it working out for your ROI? Let us know in the comments below or tweet them to us @Metrixadigital.